Scooper - Technology News: Who are the cyberwar superpowers? Which countries are the superpowers? The countries which are believed to have the most developed cyber warfare capabilities are the United States, China, Russia, Israel and the United Kingdom. These cyber superpowers have responded to a rapidly growing number of attacks in recent years. The United States stepped up its focus on cyber warfare in 2010 when US Cyber Command brought together the cyber capabilities of the Army, Air Force, Navy and Marines under one roof. Billions of dollars have been dedicated to the project. Two years ago the Pentagon announced a massive expansion of its cyber capabilities, upping staff from 1,800 personnel in 2014 to 6,000 in 2016. China has followed a similar path, recently announcing it was unifying its capabilities to better develop its cyber warfare might. Russia is also known to have heavyweight cyber capabilities. The country is strongly believed to have used cyber weapons to attack Georgia during the military incursion into the country in 2008. In early 2014, the Cyber Snake program that attacked the Ukraine is believed to be of Russian origin. Israel’s emergence as a cyber-powerhouse – with an estimated 10% of global sales of computer and network security technology – has meant it is well placed as a cyberwar superpower. And in Europe, London is seen as the centre of cyberwar specialism with the British government having invested heavily in cyber capabilities over recent years. Are there any other big players? Two other notable players are Iran and North Korea. North Korea is believed to be behind a significant number of attacks on the United States including the one which recently targeted Sony . Iran is rapidly developing its cyber capabilities and is thought to be behind several major attacks in the region. In 2012, Iranian hackers struck Saudi Arabia’s national oil company, Saudi Aramco, nearly obliterating its corporate IT infrastructure, and bringing the company close to collapse. There is concern that while there is something of a ‘digital equilibrium’ between the five cyber superpowers based on the assumption that attacks will result in reprisals, Iranian hackers seem more willing to cause damage. One Iranian group, known as Rocket Kitten has been closely tracked by many in the cyber security industry since 2014 and has been linked to numerous attacks. Many believe the group is closely associated with the Iranian Revolutionary Guard. How much are attacks costing? High-tech espionage is rife and is done for state advantage as well as commercial and criminal gain. 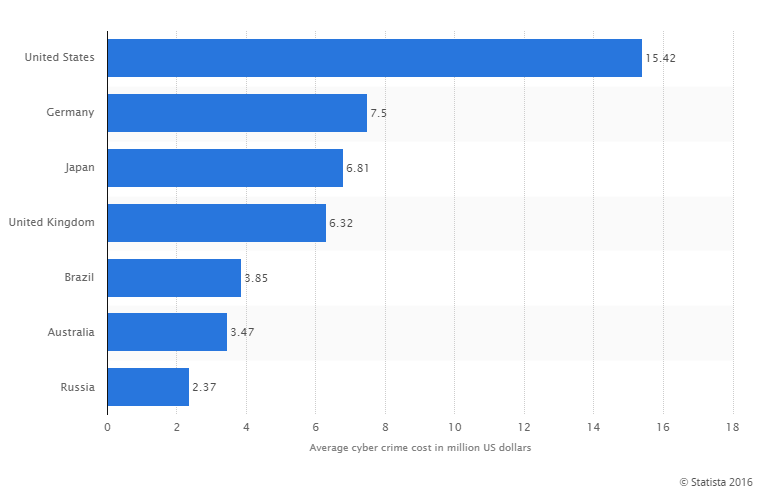 The average cost of an attack varies by country but it is high - over $15 million in the US and $6 million in the United Kingdom. The Swiss Defence Minister has said that his department was targeted by hackers in January with the suspected motive being industrial espionage. Guy Parmelin said that the cyber attack happened while he was at the World Economic Forum in Davos. The department was able to successfully “act against” the hackers. At the moment, destructive acts of cyber-attacks, as opposed to espionage like this, remain relatively rare. With a cyber arms race going on amongst the cyber superpowers there is clearly a belief that that may change, and all the major players want to be ready if it does. The offensive against Islamic State may be the first public cyber offensive we have seen but it will certainly not be the last.